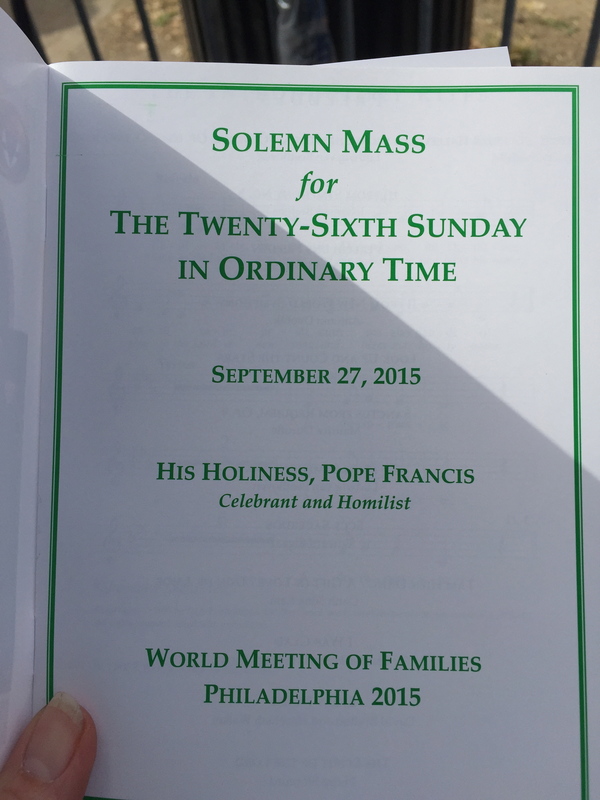 There were numerous blessings during my pilgrimage to be with Holy Father, Pope Francis. Some were personal and others shared. One inparticular was filled with great grace. 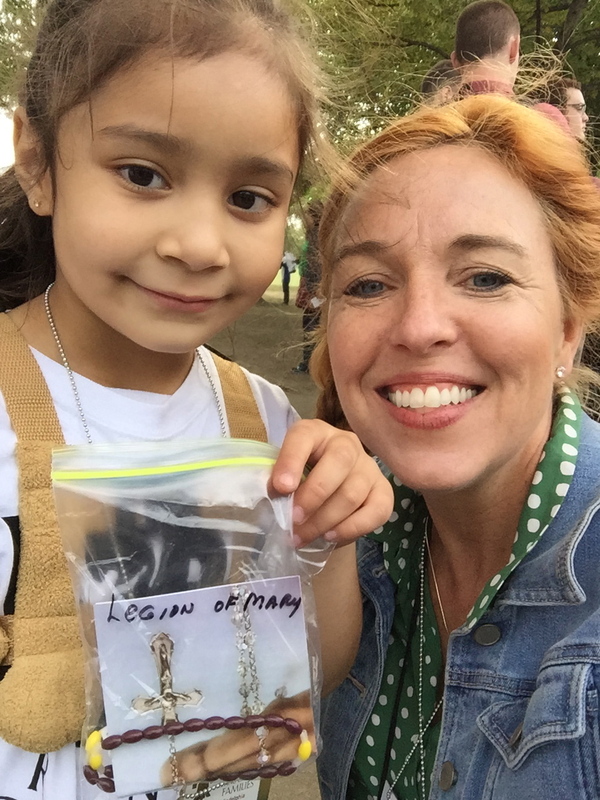 On Saturday evening I discovered, as I was departing the Ben Franklin Parkway Oval where I had been standing for 7 hours awaiting the chance to see the Holy Father at the World Meeting of Families Ceremony, I had lost one of my treasured rosaries. This rosary was given to me by a special young person while on retreat together. They had made it themselves and the cord it was made from had been dipped & died in the colors of the Divine Mercy of Chirst; which as I have mentioned I hold a special devotion to. ( You may read more about this in several of my posts under the Divine Mercy Page, located on the Menu Bar!) I had tied this rosary around my wrist, so that I would have easy access to pray the Rosary throughout my time in Philadelphia. as well as with new friends from Mexico! I am pretty certain it was lost in the course of trying to find a woman, in our pilgrimage group, who had gone missing. As I searched the area for her and while speaking to the authorites regarding the situation, I am confident it fell from my wrist. Praise be she was found, but my rosary had been lost! And although I retraced the areas I had traveled through, St. Anthony was not interceding for me this time! When I arrived at the Parkway I again marveled at the enormous number of people, just like me, who were bubbling with joyful anticipation over what was to unfold this day! And yet still there was an under-current of saddness regarding losing my rosary as I recognized my eyese were turned automatically toward the ground as I walked, in hopes of finding it. Not long after I had chosen a spot where I would set myself up to wait for Papa’s arrival, I felt a tug at the hem of my skirt. Turning around to see what had pulled at me so forceably…I found a darling olive-skinned litle girl, holding up toward me in her tiny hand, a clear plastic bag, motioning for me to take hold of it. “For me?” I asked. And with the biggest grin on her face, she bobbed here head up & down with the gesture of an enthusiastic “Yes!” Accepting the bag to see what was inside, there I found….a home-made rosary. God had guided this little angel to find me & replace what had been lost. I asked if I might give her a hug for this gift she had just given and without hesitation she warmly melted into my arms. I thanked & introduced myself to the man standing close behind her, who explained he was her father. Speaking in very broken English he explained that after coming to America from Cuba just 5 years ago, their entire family gathers each Saturday to make Rosaries together. 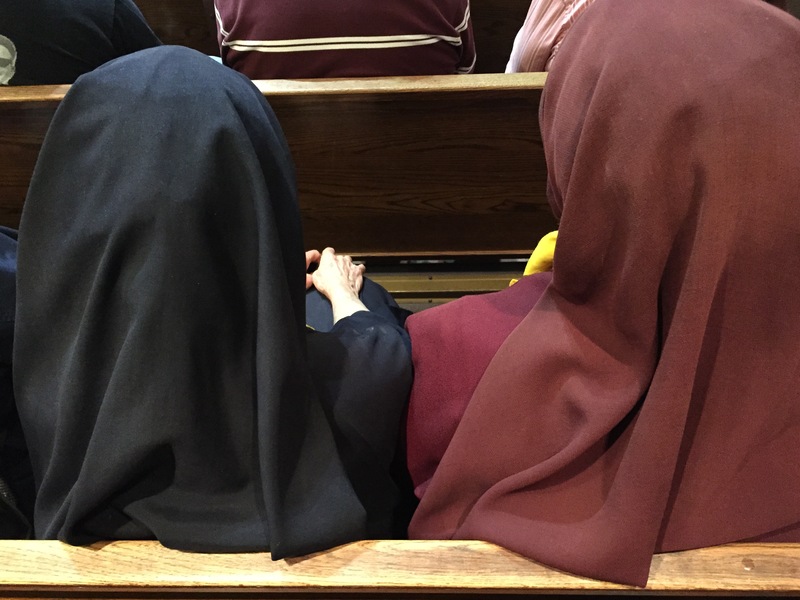 They are then given the responsibility to hand out 5 rosaries (each) that next Sunday, as a way of offering thanks to the Holy Mother for protecting them during the course of traveling safely to America. This family has committed themselves to giving Thanks to God for the opportunity to have this new freedom while evangelizing to others as a bonus! All born from the love they have for Our Heavenly Father and their desire for others to experience the same. I thanked him and hugged my little angel once more before she skipped away to give yet another of her proud creations to the next unsuspecting person she was guided toward. And I know she gave it with Love as her Mission. hugs n’ blessings to everyone who professes love to find what is lost! 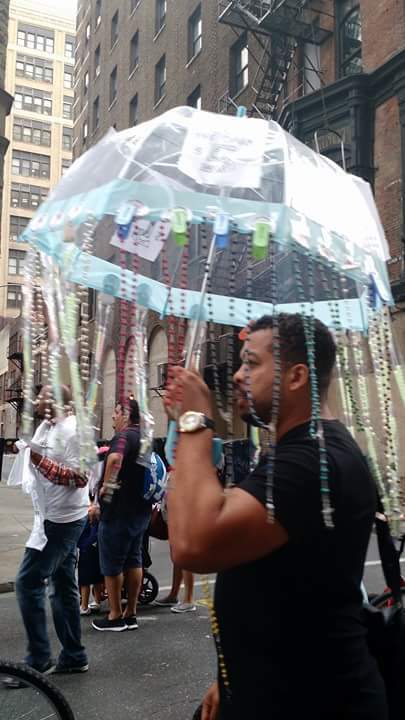 Rosaries were “raining down” everywhere in Philadelphia! Previous He Came! I saw! He went. This is so beautiful! God is good indeed! Yes He is! All day, Every day!! Hugs! I absolutely love this story and what a cute angel she is. And she was…she floated in & out of my life so quickly but will remain in my heart for always! Hugs & Blessings!